At first, his comment didn't register. After all, I was mostly out of breath and my mind was simply focused on moving my feet forward. As I ran a bit further though, it hit me. He thinks I'm still pregnant! Are you kidding me? I didn't know what was more disturbing: the fact that he misjudged me completely or the fact that he actually believed a "pregnant" woman would be out running. Either way, the comment made an impact on me, but for the better. It fueled me to press on and run hard that day! Today, I write to you seven weeks postpartum from my third pregnancy. As you already know, I'm still in my maternity clothes, about fifteen pounds over my pre-pregnancy weight, and still struggling with those dreaded numbers. Numbers on the scale don't define me though. They don't define us. Do you remember? But when should we care about the numbers on a scale? Certainly not to obtain acceptance or affection. We already discussed that here. 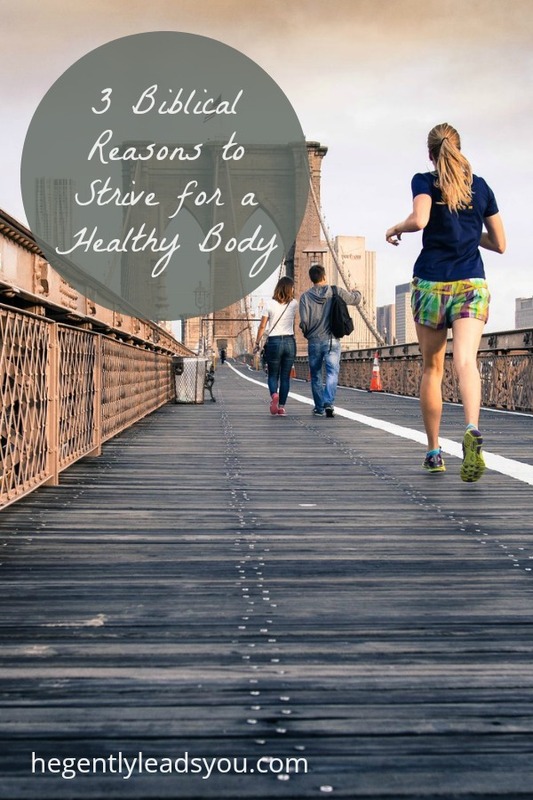 This week, we are going to study why we should strive to take care of our bodies. I don't know about you, but I need help in keeping an eternal perspective. When I lift dumbbells or am out for a run, I need to be reminded WHY I'm doing these. It certainly can't be for acceptance. It has to be to glorify God, love my husband, and to better fulfill God's purposes. That's what's going to keep me motivated: keeping more of an eternal perspective. To remind us of that perspective this week, I've put together the three above mentioned verses into a document here. Once you've printed and cut them out, you can place them on your bathroom mirror or wherever else as a reminder. I'd also love for you to join me in our study this week! Please click here to download the reading guide. Let's begin our study by reading a verse from Monday's passage. What words in this verse lead you to think the woman took care of her body? What tasks can you better accomplish if you were in better shape?